Saul Alvarez‘s fourth fight of the year – all of them world championship contests – will be against Puerto Rican contender Kermit Cintron on Saturday, November 26 in a yet-to-be-determined venue in Mexico and a match-up with the experienced 32-year-old will be Alvarez’s “toughest fight” to date, according to WBC president Jose Sulaiman, Saul himself as well as his trainer Jose Reynoso. “Saul Alvarez will face the toughest opponent on his career, Kermit Cintron is like a dog inside the ring, and Saul will face one of the best boxers in the world,” commented Sulaiman earlier this week. 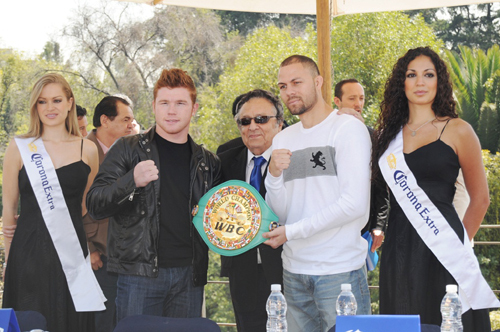 In what will be the third defence of the WBC super welterweight world title (pictured above, with Alvarez in black and Cintron in white) he was awarded for his shut-out points victory over Matthew Hatton in March, Saul – nicknamed Canelo (38-0-1, 28ko) for his cinnamon coloured hair – fights in front of his home fans against a boxer with mixed performances registered on his resume. Kermit ‘The Killer’ was knocked out in six rounds by Antonio Margarito, beat Lovemore N’Dou by way of decision, tied with Sergio Martinez in what is regarded to be a controversial result, inflicted a first defeat onto Alfredo Angulo’s burgeoning career, before dropping a technical decision to Paul Williams, losing to unheralded Carlos Molina and claiming a contentious ten round decision win over Antwone Smith in a bout where Cintron (33-4-1, 28ko) was underwhelming throughout. For Alvarez, a Cintron on an on-day as opposed to an off-day will represent a step-up in class following on from world championship defences against British veteran Ryan Rhodes and welterweight gatekeeper Alfonso Gomez. Acknowledging this, Alvarez commented: “I’m very pleased to fight in Mexico City and end the year fighting in my country, even more if it’s against a great fighter like Kermit Cintron who has lot of experience. Canelo’s trusted trainer Reynoso concluded: “This will definitely be Saul’s most complicated bout. Golden Boy Promotions named several boxers as possible rivals and they were amazed that we chose Kermit Cintron.